Our property is only about 100' deep from curbside on the north to a common woodland strip that abuts our neighbors' property on the south. Forty foot tall white pines, sugar maples and mature river birch line the back of the property line. This tight space results in dozens of micro-climates as neighboring homes and trees cast long shadows and filter the afternoon sunlight. 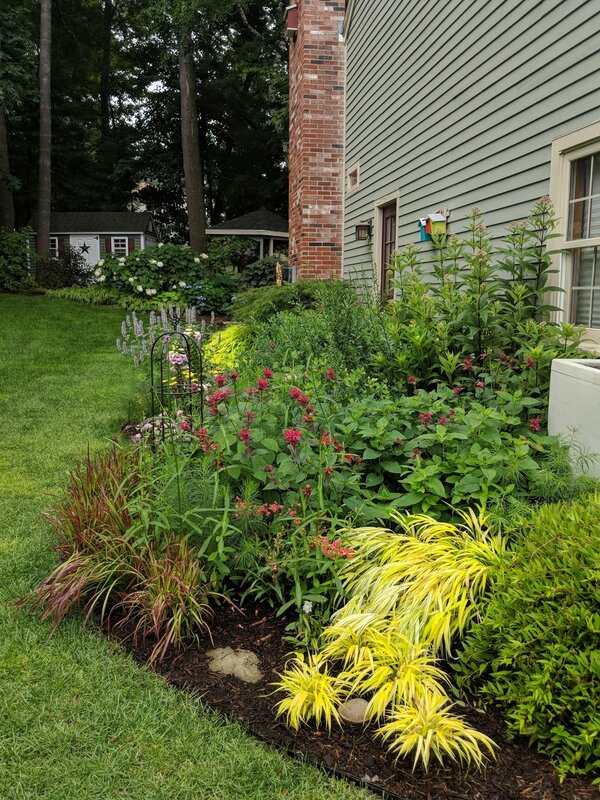 After years of tweaking and testing different sun-loving plants, this bed underwent a significant overhaul in May, 2018. 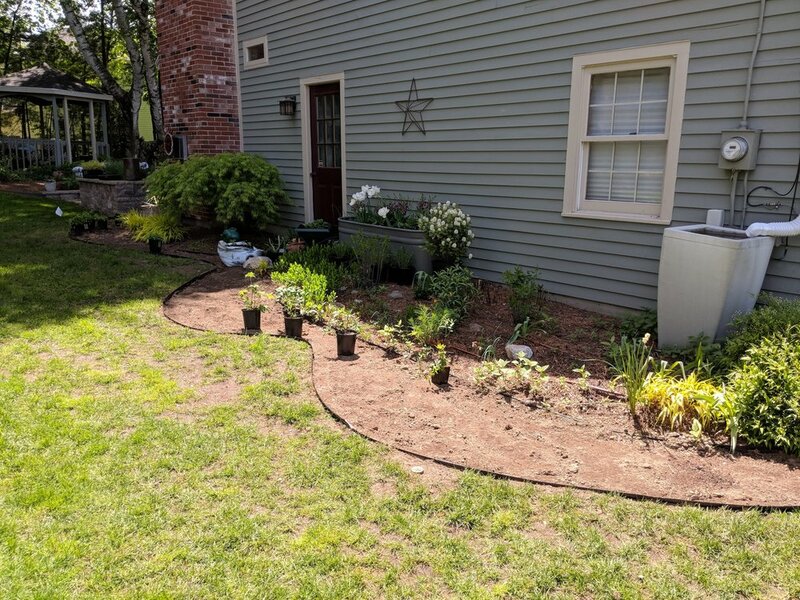 Both beds along the East facing side of the house and garage were expanded to accommodate more plants and to give existing plants more room stretch out. Drip-irrigation was professionally installed. Click on photos and navigate left or right for more information. Before (photos from 2017): This bed has potential, but is constrained. Irrigation tubing was installed in all of the foundation beds, including this one. 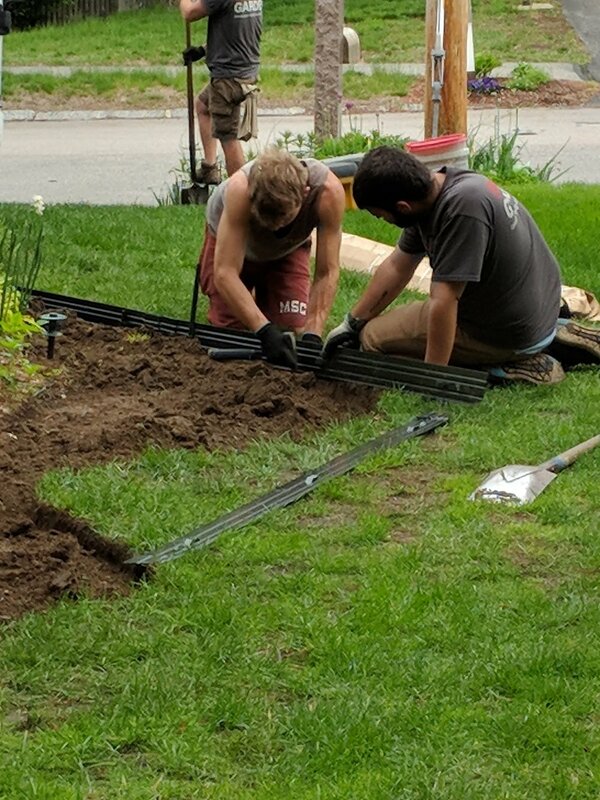 My husband and I easily installed additional tubing after the May bed expansion. Tubes are durable, weather-proof and have evenly spaced "emitter" holes that deliver water slowly. Drip irrigation keeps foliage dry and less prone to disease. 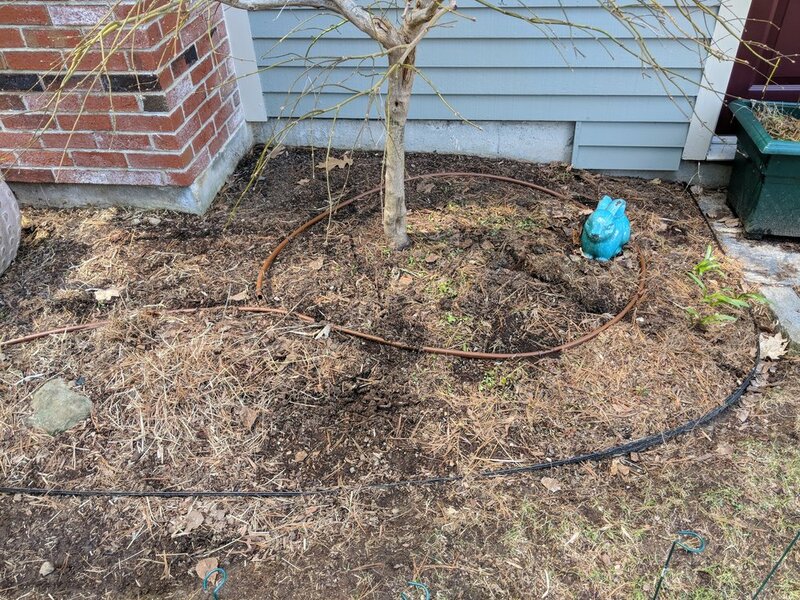 Early April is the perfect time for installation as plants are just starting to break the soil's surface and will not be harmed in the process. 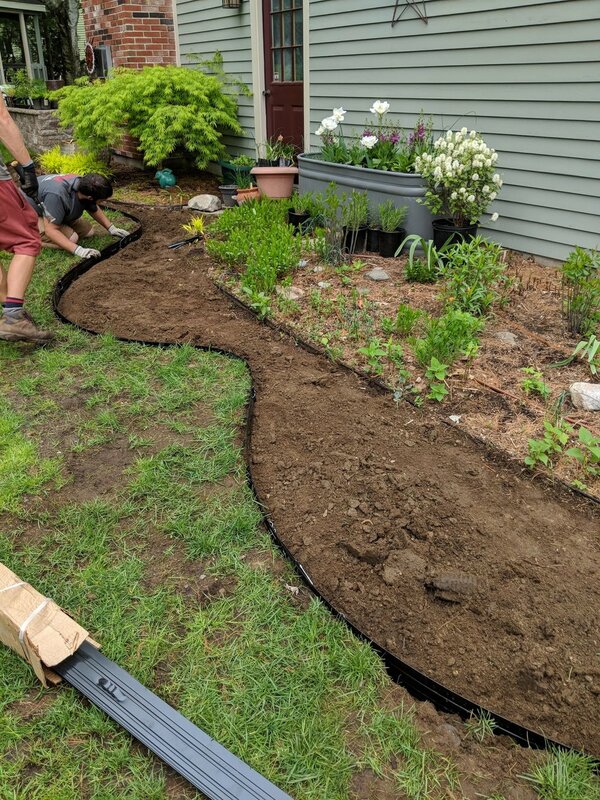 Our existing Hunter irrigation system had plenty of additional “zones” that were available for the new garden irrigation. Each zone has it’s own day and time pre-programmed based upon its unique water needs. Since installation, our utility bill has dropped meaningfully, due to the more efficient use of water and less evaporation. Plants are happier, too! A new footprint was cut out, turf removed, and permanent aluminum edging installed. I left the original aluminum edging in place in order to keep the existing plants from invading the expanded bed areas. Rich compost was added to condition existing soil, improving the structure and adding beneficial nutrients. The new footprint is intentionally curvy in order to provide "reach in" access to the planting beds. The East garden is divided into two sections. The "chimney bed" receives only about two hours of direct morning sun, followed by dappled shade, then full shade after 1:00 pm. I have been tinkering with this bed and swapping out plants as the neighbor's cherry tree grows ever taller, casting longer shadows and blocking the morning light. The Japanese Maple and Hakonechloa 'All Gold' are part-shade superstars and deserving of better companion plants. The Cryptomeria Japonica that didn't survive its first NH winter in the Chimney Bed and was replaced with a young Eastern Redbud 'Ruby Falls' - something I've had my eye on for a long time. 'Ruby Falls' can also handle the shade as can the Hakonechloa 'Aureola' forest grass. Campanula 'Pink Octopus' (way too cute to pass up!) is being tested as a shade tolerant ground cover. Penstemon 'Husker Red Improved' was selected to complement the purple foliage of 'Ruby Falls'. 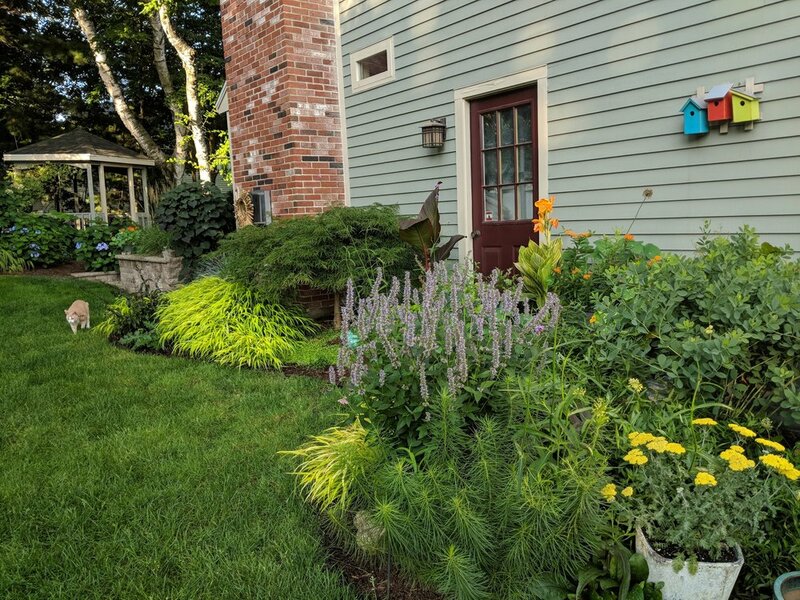 Photos in this gallery depict plant growth and the purple and gold color progression from late May install until early August in the "Chimney Bed"
The "Garage Bed" is the first to receive morning light and full sun until 1:00 or 2:00 p.m. The bed expansion offered me the opportunity to plant more of my spring lust plants, Penstemon and Amsonia 'Hubrichtii'. It also offered the chance to experiment with some new plants like Japanese Blood Grass and Clematis 'Rooguchi'. All will help shield the late summer decline of the Monarda (bee balm). Mid-July and the penstemon and trollius have given way to agastache, monarda and verbena bonariensis. Joe Pye Weed anchors this bed against the garage wall and containers extend the bed around the corner to the driveway. Agastache 'Blue Fortune' is a hub of pollinator activity from sun up to sun down. By August, the tiny purple blooms of see-through plant Verbena Bonariensis hovers among and above other tightly planted perennials. The resulting effect is magical, especially in late afternoon sun. The next wave will come in September and October when two varieties of Goldenrod burst into bloom and the Amsonia 'Hubrichtii' foliage turns reddish-orange. Need Help with Succession Blooming?